Members are an essential part of our work. Members of the HFRHS are the backbone of our activities and projects. The society is a registered 501(c)3 not-for-profit educational organization and all of our official duties and activities are performed volunteers. Your membership dues and donations fund all of our activities. /Corporate $50.00+ Any companies or individuals wishing to show more support for the HFRHS may apply for a Benefactor membership in any amount $50 or over. Membership in the HFRHS is annual, and good from January 1 to December 31. Please note that 50% of the dues are tax deductible. To apply, print the membership form on our Brochure, or print the below form and remit with your payment. 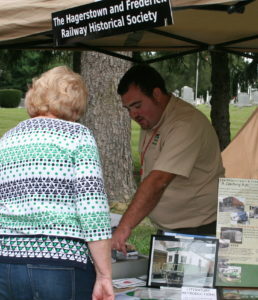 Hagerstown and Frederick Railway Historical Society Inc.
Hagerstown and Frederick Railway Society, Inc. The HFRHS, Inc. is a registered 501(c)3 Non-profit organization. 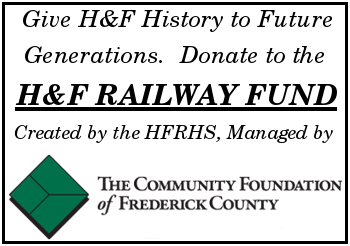 ©1999-2018 Hagerstown and Frederick Railway Historical Society, Inc.